If you find yourself parking on the streets around Murch Elementary, be on the lookout for new signs. Growing enrollment at Murch presented a parking problem for faculty and staff at the start of this school year. During the summer, large temporary modular classrooms were erected on the school’s parking lot. This took away half the 60 available spaces. Compounding the problem, most street parking around Murch is zoned for residential use, so Murch employees who do not live in Ward 3 cannot park on the street without risking a ticket. Visitor parking permits offered a possible reprieve. Malachy Nugent, a Murch parent and ANC 3F commissioner, had loaned his visitor permit to the school in the past with few complaints from the neighbors, since teachers only parked during the day, when many residents are also at work. But there was not enough time to organize this effort before the opening of school. By Thursday, August 22th, with school starting Monday, August 25th, there was still no solution in sight. This parking challenge prompted the Home and School Association, ANC 3F and Councilmember’s Cheh office to work together on a couple of fronts. Mr. Nugent sought out a short-term solution with the Second District police commander whereby teachers and staff would get permits to park for two weeks on neighborhood streets near the school. It was unclear whether that was going to work out. Then, conversations between Cheh’s office and DDOT resulted in the reclassification of parking around the school. 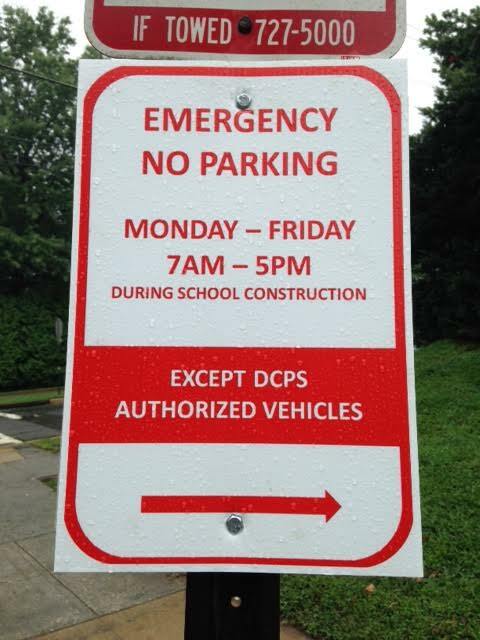 By last Monday morning, new signs were up around the school stating that parking is off-limits Monday through Friday from 7 a.m. to 5 p.m., except for DCPS authorized vehicles. The signs also state that this will be in effect during school construction, so they could be in place for at least the next three years. The modernization and expansion at Murch won’t begin until 2015 and won’t end until 2017, at the earliest. I would love to understand the delay in the Murch School renovations. Does anyone know what has caused this? Significant projects have been undertaken at other schools in the neighborhood – Murch may be the last school in the area never to have been renovated. The short answer was that the mayor promised funding for Murch earlier, but didn’t budget any money for the renovation until FY2015. The reasons aren’t clear.